This light and easy salmon dish is perfect for a mid-week meal. 1. Place the soy sauce, sesame oil, vinegar, honey and garlic in a small pot. Bring to the boil and reduce until the sauce thickens enough to coat the back of a spoon. 2. Meanwhile, heat the rapeseed oil in a heavy-based frying pan set over a medium–high heat. Allow the oil to get very hot. Season the salmon with a pinch of sea salt, then place in the pan, flesh side down. This will help achieve a nice crust on the outside and a moist texture on the inside. Cook for 4 minutes, then turn the salmon over and cook the other side for 2 minutes. 3. 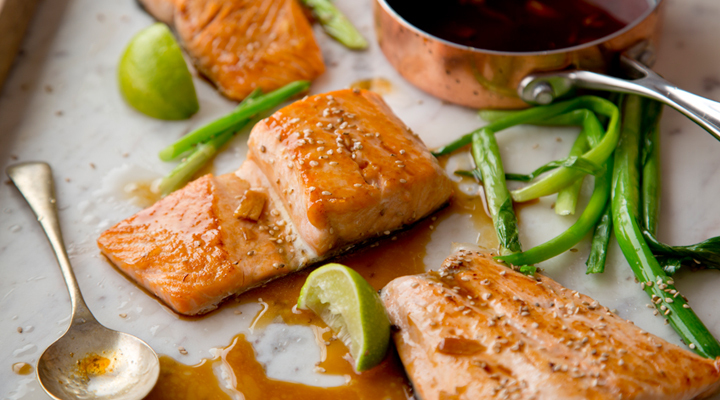 Place the salmon on a platter, spoon over the warm dressing and garnish with toasted sesame seeds. Tip: You can make this dish with any oily fish, such as mackerel or trout.